This is what is on my mind today… it is on my sister, and my baby brother, and my video game. Plus it is on my light saber. Third grade so far is so good. I got a new desk, and a new partner too, and new timed addition. Plus I learned less than greater than. Also I have a xo for my group. All of us in room twelve miss you. Does your surgery hurt really badly? I am sorry you are in the hospital. I have a baby brother and he is funny and super silly. Plus I play with him. We play hide and seek. Here is my plans for Halloween … I'm going to carve pumpkins and go Trick or Treating. When I put on my costume it will be awesome and cool. My baby brother is going to be a devil. He looks funny in it. I have a brother and he is a baby. One day he was missing. I said his name as loud as I could. He wasn’t there. This was bad. The next day I put up signs to find him they said call 968-572-985 and meet me at the bowling alley with him. I was sad. One day I found him. This blog article is about the army war. Lives can be saved if there is not an army war. If there is an army war lives will die. People don't want to die. ARE YOU having fun? I am. I feel awesome. Report cards tell how your grades are in class. They tell in class, gym, and music class. When you get it check it when you get home. They are a good thing. It shows your grades and stuff. But you might get in trouble because you might have a bad report card. But you might have a good one. This is what is on my mind today. It is on my baby brother, my video game, my build your own light saver, and my toys. My mind is also on Aeden in the Tot lot playing with the toys, having lots of fun. Aeden is funny playing with the toys. This is what my mind is on. It is on my baby brother, my toys, when I was a baby, my build your own light saver, and my Texas bear. When I was a baby I put my grandma's shoes lined up on the bath tub, I pretended cars were air planes, and I got into baby powder. This is why I miss Mr. Ahlness - the fun stuff he let us do, the math boxes he let us do, and when he let us sign up for xo’s. He also let us do what ever math box we wanted, he let us do Nim and other games, and he let us have a good time in Room Twelve. 3. Have fun so I can be good and listen to grown ups. Things to do. What they mean. Roadrunner I need your real name bacause I DONT KNOW YOU. Plese tell me your real name. Obama was good there. I thought it was AWESOME with Obama there. It was so good. I want the Government to make it so people don’t have to pay them. Obama was good there. I thought it was AWESOME with Obama there, it was so good. I want the Government to make it so people don’t have to pay them. This is what is on my mind today. It is on my baby brother, my new Bucugan figure, my other baby brother, my build your own light saber, and my DS. My mind is also on my sister, my new Star wars figure count dookue, my Game Cube and my Wii and my my Sims game. My weekend was AWESOME. I got the last Pure Heart  on Super Paper Mario, I also played with my baby brother, and I played with my sister. On my mind is my baby brother, my other baby brother, my step sister, how I am going to fix my broken build your own light saber, and what I am going to learn today. I want you back, it was fun with you. I liked it when you put on One More Candle, yeah that was the best. I really miss you and it was fun when you were at school. That WAS the BEST. I mean come on, you're really fun. PLEASE COME BACK. YOU'RE SO FUN, COME BACK. I got it by collecting $179 dollars. My DS cost $169 dollars. It is really cool and awesome. I play on it a lot. AHHHHHHHHHHH I hate it. It is stupid (it is a test, the WASL.)! When will it stop? Anyways it is hard. I don’t like it. You have to use a No. 2 pencil. You get snacks. We got oranges. You draw pictures when you’re done. (Early) You will stop soon. You are almost done! Are you good at math? Because the first time you do it is reading. The second time it is math! I like the WASL now. You have to do the reading two days. Also two math days. It’s the last day of the WASL. I have a complaint. I like the WASL. I don’t like how there is four days. But I know I will do it again in 4th and 5th grade. I cant wait until 4th and 5th. This is the 3rd grade WASL. Just follow what your teacher says. Read this article and send comments telling your dreams! I change the font on my blog. It’s fun to change the font. I have good articles in my blog. I like my blog a lot. I have an awesome blog! My blog is cool. It’s black and blue. Ascend the blog, your blog has articles. 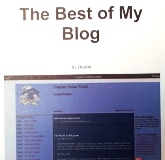 My blog is a article type blog. Your blog is your blog. Blog’s have names. All the blog’s have names made by the owner. The blog’s name can be changed. The name is only a name that the owner chose.